The Nikon D5600 might have been announced a few months ago, but now it’s just now coming to the US at CES 2017. Compared to the initial DSLR announcement, there’s nothing special or different about this stateside-bound edition. Catching you up to speed, the Nikon D5600 is a very slightly upgraded version of the D5500 with improved wireless connectivity and added time-lapse functionality. The Nikon D500’s acclaimed SnapBridge technology comes to the Nikon D5600 to establish a constant wireless connection to your smartphone. Meanwhile, Nikon has pulled the simple time-lapse movie function from the Nikon D7200. 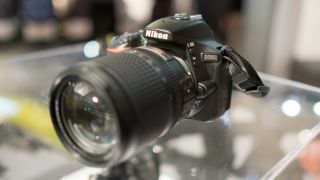 Otherwise, the Nikon D5600 has much in common with its predecessor, including a 24.2MP APS-C sensor that forgoes having an optical low-pass filter and an Expeed 4 Image Processor. The Nikon D5600 will be available later this month and will run for $799 or £799 (about AU$1,110) when kitted with the Nikkor DX AF-P 18-55mm f3.5-5.6 DX lens. Nikon is also offering the D5600 in a two lens kit (with the aforementioned kit lens plus the Nikkor DX AF-P 70-300mm) for $1,149 (about £935, AU$1,595), Nikkor DX AF-S 18-140mm f3.5-5.6G ED VR lens for $1,199 or £989 (about AU$1,665), and lastly body only for $699 (about £570, AU$970). Nikon has also announced two new additions to its compact lineup with the CoolPix W100 and A300. Both cameras share a similar ruggedized design withstand drops, water and freezing. The Nikon CoolPix W100 and A300 also feature Nikon SnapBridge technology for seamless connectivity and sharing to smartphones. However there are some key differences between the cameras. The Nikon CoolPix W100 is equipped with a 13.2-megapixel sensor and 3x optical zoom Nikkor lens and full HD video capability. Meanwhile, the Nikon CoolPix A300 features a 20.1-megapixel sensor that only records HD video (i.e. 720p) and 8x optical zoom lens with built in vibration reduction. The CoolPix W100 will be available in Blue and White for $159 (about £130, AU$220) while the CoolPix A300 only comes in Silver and runs for $139 (about £110, AU$190).